Stampin’ Up! is conducting a survey to help us better understand your needs and wishes as a Stampin’ Up! customer. Please take a few minutes (less than 10) to complete the survey. The survey is completely anonymous, and Stampin’ Up! will not gather any of your contact information. By answering the questions to this survey, you will help Stampin' Up! help me be able to help you more. So we all win. Once you have completed the survey, and you live in Australia, email me what the last question is and I will send you some freebies as a thank you. Registration has been extended. So you can now register any time during the club term, which runs until the end of March. So if you haven't registered yet, it's not too late. Each month you will get a supply of new products, project kits and tutorials on using those products. 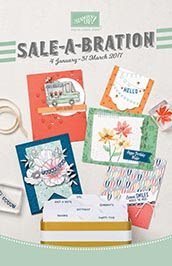 You will even get a FREE Sale-A-Bration item each month. Just go HERE for more information and to register. February's Class is using the gorgeous Dragonfly Dreams bundle. You will need to have a die cutting machine, like the Big Shot shown above, for this class. Big Shot not included as part of the class fee. This is the new product you will get with your project kits and instructions. Because the products in this class are worth more than $90, every class attendee gets to choose a FREE item from the list below. To see what these products look like, just click on the image below. Please note the kits will start shipping late February. Registration will remain open until the last day of the month.